A perfect one-skein project for that special skein of worsted weight yarn you’ve been saving! 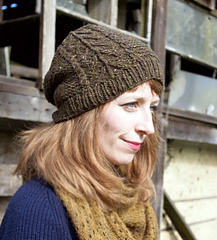 Stylish, slouchy, understated and hip, this hat is perfect for both the ladies and the gents. 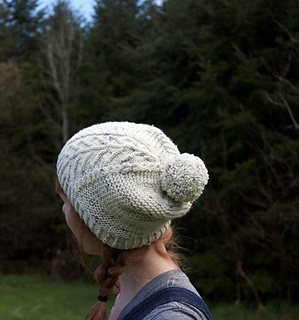 Inspired by the vast Oregon timberlands which surround my home and the loggers (or fallers), who work here, this hat features a tree and cable twist pattern surrounded by rows of simple garter stitch. A great pattern to try out cables for a beginner, or a quick and easy project for a more seasoned knitter! 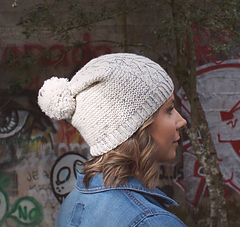 The white version is knitted in Madelinetosh Tosh Vintage, color Birch Grey. The green is Soft Donegal by Studio Donegal. Any worsted or aran weight yarn would be great for this project! The cable pattern is both written and charted. 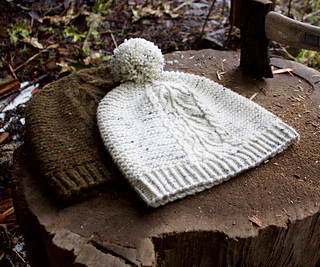 Join the boyland knitworks group to stay updated on new designs, chat about WIPs and share FOs!